When clients come to Gary A. Zucker & Associates, P.C. in Brooklyn, they have strong advocates for their legal rights. Our attorneys will always fight diligently for clients, particularly if they or their loved ones were involved in serious auto accidents that caused life-changing or fatal injuries. Many times these kinds of cases involve motorcyclists, who can be harmed severely on highways as well as on city streets. As you can imagine, people who drive motorcycles are extremely vulnerable to injury. Motorcyclists are exposed, and when involved in a single-vehicle accident or a collision with another vehicle, the possibility of major injuries with lasting repercussions is very high. Be sure to always wear a motorcycle helmet when you're on the road, as well as a good riding jacket, gloves, and proper pants and boots. This basic safety gear can prevent or minimize the following injuries that motorcyclists often experience following an accident. Road rash is a general term applied to major abrasions that are experienced when a rider makes contact with the street. Major scrapes and cuts can occur, especially if an accident victim skids along the road for a long distance. This is why fully covering up your arms and legs with sturdy gear is so important. Biker's arm happens following the the impact of a person falling off or being thrown from the motorcycle. It's instinctual for people to hold out their arms to brace for impact and help break the fall, and in doing so, the sudden impact can do damage to the nerves in the arms. Major nerve damage can have permanent results, though gloves and riding jackets can minimize the trauma. Given the force generated from a collision and the vulnerability of a motorcyclist, it's no surprise that many motorcycle accidents lead to broken or fractured bones. Similarly, sprained or twisted joints can also occur from the motorcycle accident as the driver is thrown and tumbles. Blows to the head are always deadly, and that's especially the case when they occur in a motorcycle accident. This is why New York State laws require motorcyclists to wear a helmet while operating their vehicle. 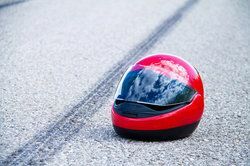 Keep in mind that even if you are wearing a helmet, you can still suffer a concussion or another kind of head injury if the accident is severe. In major accidents, it is possible for a motorcyclist to experience some sort of spinal cord injury. This could involve the muscles and nerves of the spinal cord being pinched, or it might involve damage of some kind to the vertebrae or the spinal column. These kinds of injuries need to be taken very seriously as major spinal cord injuries can cause paraplegia or quadriplegia. For more information about you legal options following a serious motorcycle accident or any type of motor vehicle collision, be sure to contact our personal injury lawyers today. The attorneys at Gary A. Zucker & Associates, P.C. will fight diligently for you in your time of legal need.